The women's wing of the Delhi Congress staged a protest outside Kejriwal's residence demanding government jobs for the kin of the Bawana fire victims. NEW DELHI: The women's wing of the Delhi Congress on Saturday staged a protest outside Chief Minister Arvind Kejriwal's residence demanding government jobs for the kin of the Bawana fire victims and also to ensure that female workers in factories are not paid below the minimum wages. Hundreds of Delhi Congress women's wing workers, led by party's city women wing chief Sharmistha Mukherjee, gathered outside Kejriwal's residence here in the Civil Lines area of north Delhi and raised slogans against him. Speaking to IANS, Mukherjee said, "We are protesting here to demand justice for the victims of the Bawana fire tragedy and also a government job to their kin." Mukherjee's remarks came in the wake of a major fire at a Bawana plastics warehouse last week, which was also used to store firecrackers. At least 17 people, including 10 women, were burnt to death or asphyxiated and 30 others were injured in the fire. She said her party has demanded that the Delhi government ensure minimum wages along with a safe and good environment for the women factory workers. 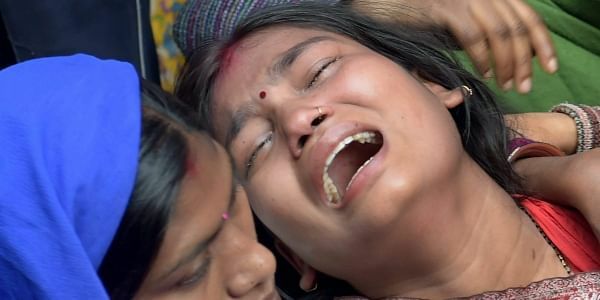 "After the fire tragedy when we visited and spoke to the women workers there, they told us that they were only paid about Rs 6,000 a month, whereas the minimum wage in Delhi is prescribed at over Rs 15,000," she said. She said the women workers told them that they were not given any benefit of government rules like maternity leave etc. "Thus we demand that Kejriwal's government must provide women with all the government facilities which are their right, including maternity leave," she said. The Delhi Congress women wing chief also said the government should ensure proper and safe environment for the women workers. "We are protesting to improve the working conditions of the women workers in the unorganised sector of the country," she added.